A necessary condition for being P applies to all things that are P. does a sufficient condition for being P apply to only things that are P? My textbook says that a definition of P has to apply to 'all and only things that are P.' How does this map onto necessary and sufficient conditions? It may help to use a diagram to make sure one is meeting the technical definitions. Here is a Venn diagram showing P and two possible definitions of P, Def 1 and Def 2. 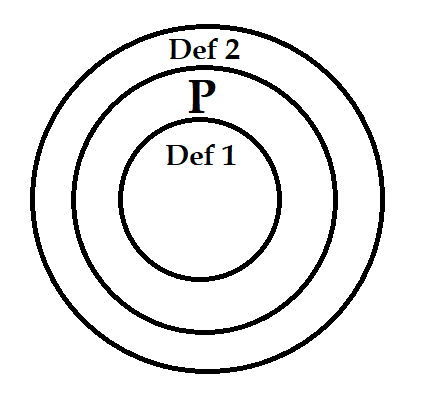 Def 1 applies to only P. It does not apply to anything that is not in the circle defined by P. Def 1 is a sufficient condition for P. If Def 1 then P. The problem with it as a definition is that it might not apply to all P. There might be some P it is missing since the P circle is larger than it. Def 2 applies to all P. Def 2 is a necessary condition for P. The problem with it is that it might not apply to only P. The Def 2 circle is larger than the P circle. In the conditional statement, "if S, then N", the expression represented by S is called the antecedent and the expression represented by N is called the consequent. This conditional statement may be written in many equivalent ways, for instance, "N if S", "S only if N", "S implies N", "N is implied by S", S → N , S ⇒ N, or "N whenever S". In the above situation, we also say that N is a necessary condition for S. In common language this is saying that if the conditional statement is a true statement, then the consequent N must be true if S may at all be true (see "truth table" immediately below). Phrased differently, the antecedent S cannot be true without N being true. For example, in order for someone to be called Socrates, it is necessary for that someone to be Named. We also say that S is a sufficient condition for N. Consider the truth table again. If the conditional statement is true, then if S is true, N must be true; whereas if the conditional statement is true and N is true, then S may be true or be false. In common terms, "S guarantees N". Continuing the example, knowing that someone is called Socrates is sufficient to know that someone has a Name. In the diagram above, Def 2 is a necessary condition for being P. It applies to all things that are P. The problem with it as a definition is that it might apply to things that are not P as well. Def 1 is a sufficient condition for being P. It applies to only things that are P. It is possible that it does not apply to anything that is not P. So the answer to the question does a sufficient condition for being P apply to only things that are P would be "yes". Necessary and sufficient is the same of "if and only if". A definition is formalized with a bi-conditional, i.e. with the logical connective translating "if and only if". The reason is that a definition must license us to replace in very context the definiendum (i.e. the "predicate" that we are defining) with the definiens (i.e. the phrase used to define the definiendum). “A lake is a large, landlocked, naturally occurring stretch of water”. "Something is a lake if and only if it is a large, landlocked, naturally occurring stretch of water”. In the conditional statement "If P, then Q", we say that "P is sufficient for Q" because P being true always implies that Q is true. Thus, the part "Something is a lake if it is a large, landlocked, naturally occurring stretch of water”, i.e. "If something is a large, landlocked, naturally occurring stretch of water, then it is a lake", we have that the definiens is a sufficient condition for being a lake. And similarly, for the "only if" part : "If something is a lake, it is a large, landlocked, naturally occurring stretch of water”. In this case, we have that the definiens is a necessary condition for being a lake, because something cannot be a lake unless it is a large, landlocked, naturally occurring stretch of water. Not the answer you're looking for? Browse other questions tagged logic or ask your own question. What is the difference between “necessary” and “sufficient”? Are all sufficient conditions necessary? For preventing something, why do we usually search for the Necessary and not the Sufficient Conditions? Intuitively, why is a Necessary Condition, weaker than and opposite of, a Sufficient Condition? Is the Logical meaning of <only if> produced by the Adverb <only> (that widens the Complementiser <if>)? Are “All A is B” and “If A then B” always logically equivalent? Is being something and not any other thing a necessary and sufficient condition of existence?